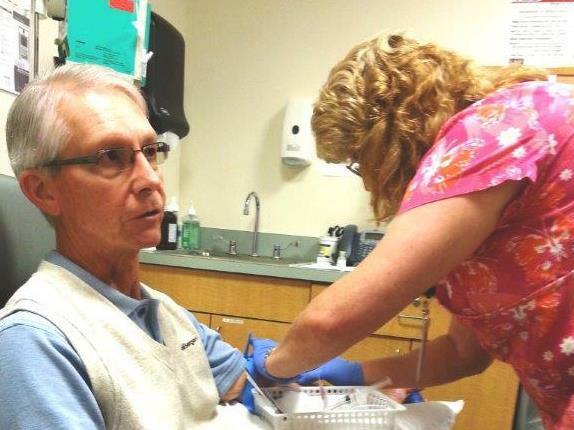 Ed Hancock of Ocala sees USF Health Byrd Institute nurse Beth Major once a month as part of the A4 cinical trial. When you’ve been diagnosed with an incurable disease, there’s a huge incentive to sign up for a drug trial. But what if you’re healthy? What’s the incentive? Thousands more volunteers – including Floridians - are needed in the test population: people ages 65 to 85 who appear to have normal memories. They can be tough to recruit, said Keith Fargo, director of scientific programs and outreach for the Alzheimer’s Association. ”They’re looking for people who are very high-risk for Alzheimer’s disease but who don’t yet have any symptoms, such as memory problems or difficulty thinking,” he said. The trial involves the drug solanezumab by Eli Lilly & Co., one of several drugs aimed at beta amyloid, the pieces of protein that clump together and destroy nerve cells in the brain in Alzheimer’s disease. Earlier trials of solanezumab as a treatment showed little or no benefit for those who already had advanced Alzheimer’s. But it appeared to show promise for those in the earliest stages. 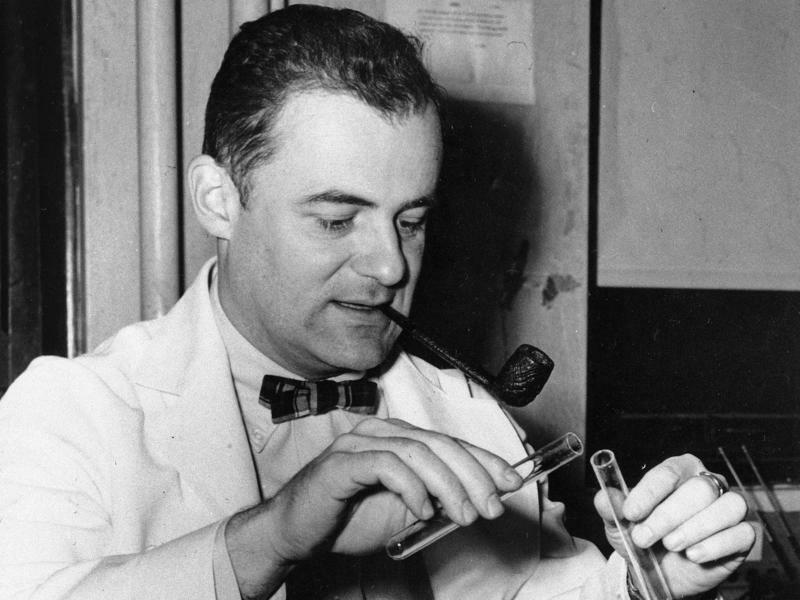 That led to the A4 trial, co-sponsored by the company and the National Institute on Aging, as well as private philanthropies. The A4 trial started in spring of 2014. The goal was to have 1,000 active participants by this month, so that there would be three-year results by December 2018. But as of this month, fewer than 400 people have been “randomized” to receive either the drug or placebo, trial coordinators said. “We really need people to participate because this is truly the first step to a cure,” said Dr. Amanda Smith, medical director for an A4 research site in Tampa at the University of South Florida. 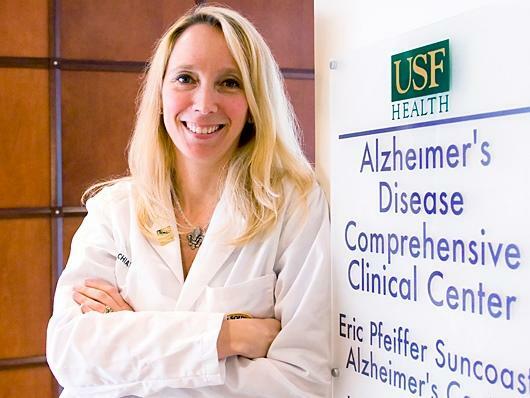 Her team at the USF Health Byrd Alzheimer’s Institute had only two A4 patients receiving treatments as of early December after screening more than 40. Byrd staff members have been scrambling to find volunteers -- particularly from minority populations, which tend to be under-represented in clinical trials. Harvard neurologist Reisa Sperling, principal investigator, says it took longer than expected to get some sites ready and certified for the trial because of the expertise and equipment required. She said sites need to have PET (positron emission tomography), MRI (magnetic resonance imaging) and specialized software. When the trial was launched in spring 2014, publicity piqued interest, especially among those who have a family history of Alzheimer’s disease. But some sites weren’t ready to begin screening at the time, Sperling said. The Mayo Clinic had nine patients receiving either treatment or placebo as of early December, said trial coordinator Dana Haley. “We had been collecting names of interested participants since we first heard about the study in late 2013, so we had a large pool to recruit from,” Haley said. Volunteers for A4 who meet the entry criteria on age and other matters go through two levels of screening. The first level, as the Byrd Institute in Tampa conducts it, is an in-person conversation with a psychologist trained to use questions to elicit the level of functional memory. Those who score in the normal range move on to a PET scan of their brain, which shows any abnormal protein deposits and other problems in vivid color. Those who have a positive screen for amyloid plaque are asked to join the A4 trial. If they agree, they then begin the monthly IV treatments, receiving either the saline solution or the drug, solanezumab. The IV infusion takes about half an hour once a month. It doesn’t hurt, says Ed Hancock, one of the participants in the A4 trial at the Byrd Institute. He lives in Ocala but drives to Tampa for the treatments because he likes the team, including trial coordinator Kelly Rodrigo and nurse Beth Major. As in other randomized, double-blind trials, neither the patients nor the staff know whether they’re receiving the experimental drug or the placebo, a saline solution. 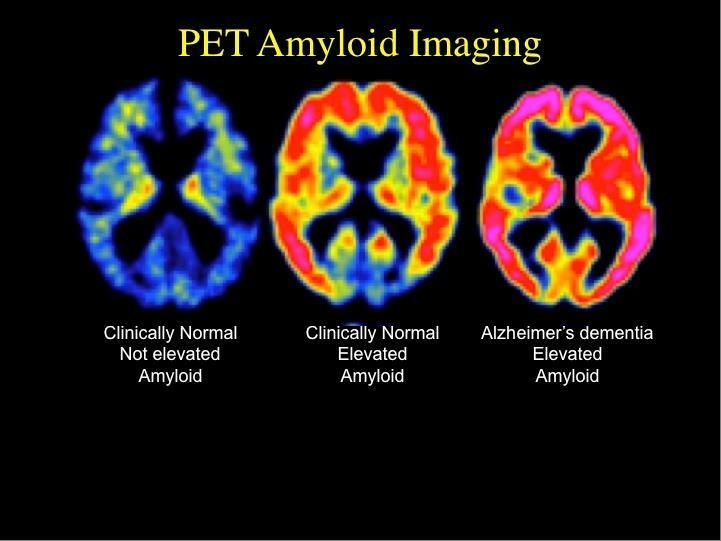 If the drug works as intended, it will clear protein clumps called amyloid plaques out of the brain before they cause permanent damage. Tau, another protein thought by some to be the main culprit in Alzheimer’s disease, would be removed, as well. In August 2104, when the USF team told Hancock that his PET scan was positive for amyloid plaque, he wasn’t surprised, he said. Both his parents died of Alzheimer’s, and his sister was diagnosed around 2007, he said. “I try to stay pragmatic about it because the more you look for it, the more you’re going to see it, and the more worried about it you get, the bigger deal it becomes,” Hancock said. Hancock, 66, serves as a director on the board of the Central-North Florida chapter of the Alzheimer’s Association. His educational and fundraising work is extensive, and he is still able to make all the required travel arrangements himself, said his wife Diana. She said she doesn’t know whether that is a sign that he is getting solanezumab and it’s working, or whether he is getting the placebo and his brain is not yet damaged enough to cause symptoms. Dr. Smith at the Byrd Institute says it is hard to know in such cases. “The thing is, we know that plaque starts to build up 10 to 15 years before people ever have the symptoms of forgetfulness,” she said. A4 researchers had been warned that it might take 10 screenings to find one positive scan, but the rate of negatives at Byrd has been even higher than that. Of the first 43 people who have undergone screening in Tampa, just two qualified to undergo treatment. Dr. Smith said even though the delay is frustrating, she’s happy for the many people who have undergone the PET scan and found out they are negative for amyloid. “There are people who wake up worried every day (that they have Alzheimer’s disease in their future) and then have this PET scan and find out they don’t, and they are almost not sure what to do with themselves because they were so sure that they did,” she said. Some who should be getting tested shy away. Participant Hancock, who has tried to recruit people for the A4 trial, says they claim to be too busy. He thinks they’re in denial. One benefit of volunteering for clinical trials is that the medical care is free, and often it’s at a sophisticated research center. A particular advantage of this A4 trial is that people who pass the first level of screening get a free PET scan. Otherwise, an asymptomatic patient would have to pay $4,000 out-of-pocket. 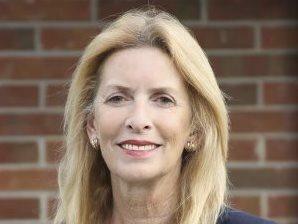 Finding a way to prevent Alzheimer’s would be of enormous benefit in Florida, she said. With the bulk of the Baby Boom still to hit age 65, she says, close to 500,000 Floridians already are living with Alzheimer's. With a large aging population, Florida is an epicenter of Alzheimer’s cases in the United States. Roughly half a million people in the state live with the disease and by 2025, that number is projected to increase by 44 percent. Mount Sinai Medical Center in Miami Beach and University of Florida Health just got 1.5 million in funding from the National Institutes of Health to run the only full-time Alzheimer’s Disease Research Center in the state to try and combat these numbers. Larry Goldstein is trying to find drugs to treat Alzheimer's disease. A biologist in cellular and molecular medicine at the University of California, San Diego, Goldstein also just started testing something he hopes will enable paralyzed people to walk again. For both lines of research, he's using cells from aborted fetuses. "The fetal cells are vital at this time because, to our knowledge, they have the best properties for the kinds of experiments that we need to do," Goldstein says. Julie Martin sits at a table in a nondescript room at Suncoast Hospice in Clearwater. She strums an instrument called a Qchord, a type of electronic autoharp. "Hello my friends. Hello my friends," she sings in a slow, comforting voice. "Hello my friends, it's nice to see you today." Martin, a board certified music therapist, sings "The Hello Song" with every Alzheimer's patient, every time she sees them. 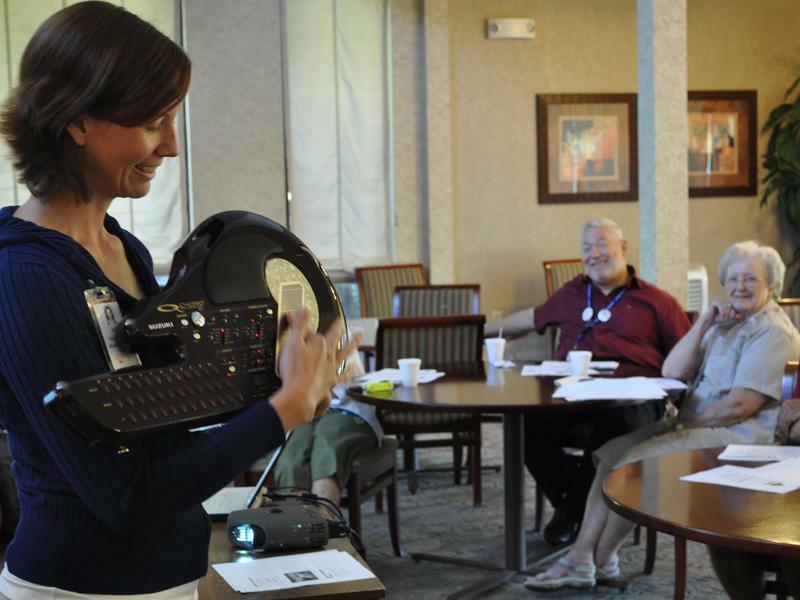 She said music can help these patients reconnect to their lost memories.